This cool space wallpaper is a composite color image of the Herschel PACS 70, 100, 160 micron-wavelength images of Betelgeuse. Professional astronomers also keep a close eye on the star, as it is notoriously variable: its diameter changes from anywhere between 550 to 920 times the sun's diameter. In 2013, astronomers said Betelgeuse is likely to crash into a "cosmic wall" of interstellar dust in a few thousand years. It is probable that the name "Betelgeuse" originated in Arabic words, but the star had other names (for example) in Sanskrit, traditional Chinese and even in Hawaiian; in the latter, it was known as Kauluakoko. Betelgeuse is so vast — its size would extend beyond Jupiter's orbit if it were placed in the sun's position in the solar system — that several telescopes have captured images of the star and spotted it shedding mass. Starting in 1993 and continuing for at least 15 years, its radius shrank by 15 percent, an astonishing amount for so short a time. "We do not know why the star is shrinking," said Edward Wishnow, a research physicist at UC Berkeley's Space Sciences Laboratory, in 2009. "Considering all that we know about galaxies and the distant universe, there are still lots of things we don't know about stars, including what happens as red giants near the ends of their lives." Ongoing observations of Betelgeuse reveal that we still have much to learn about its structure. Observations of the red giant revealed that gas that is leaving the star is colder than astronomers thought it would be. Scientists aren't sure how so much mass left the star, while not generating a lot of heat, they said in a 2016 study. Possible explanations include magnetic fields, or shockwaves, but more work will be needed to confirm the models. Astronomers are also doing comparison studies with another red supergiant star, Antares, to better understand the situation. 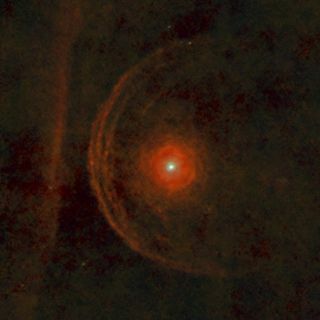 Meanwhile, scientists remain puzzled by Betelgeuse's ultra-fast rotation, which is about 150 times faster than expected. This may have happened if the star swallowed a sun-mass star about 100,000 years ago, according to a 2016 study. Given Betelgeuse's huge size — it's 1,000 times wider than our sun, or 860 million miles (1.4 billion kilometers) across — it should be spinning much more slowly, astronomers suggest. In 2017, the Atacama Large Millimeter/submillimeter Array Telescope (ALMA) took its first image of Betelgeuse's surface, which astronomers said was the highest-resolution image yet obtained of the star.